As the baritone saxophonist for the Harvey Pittel Saxophone Quartet from 1988-2001, he presented concerts around the world in affiliation with Columbia Artists Management (NY, NY), Midwest Arts Alliance, and he Texas Commission on the Arts. Concert tours included the cities of New York, Los Angeles, Chicago, Washington D.C., Honolulu, Lisbon, Bangkok, Halifax, and San Miguel de Allende. Additionally, the group performed on university/college campuses, radio/television programs, orchestra pops series, and as featured artists with wind ensembles. From 1991-2009, he toured as soprano saxophonist with the ELISION Saxophone Quartet sponsored by the Texas Commission on the Arts Texas Touring Artists Roster. 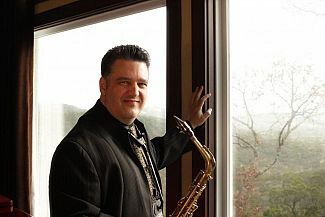 Todd Oxford’s recordings and performances have been reviewed by publications to include the New York Concert Review, American Record Guide, Los Angeles Times, Saxophone Journal, Clarinet & Saxophone (United Kingdom), Saxophone Life Magazine (United Kingdom), Clarinet & Saxophone (Australia), Amazon.com, Audiophile Audition, Austin American Statesman, and San Antonio Express News. He is featured on eighteen commercially available recordings to including his own discography, Syanesthesia, Tango Magnetism, Finesse, and Live Through the Years released on the Equilibrium/Sunset Record Label and distributed worldwide by The Orchard. A new album, Synaesthesia, was released in early 2014. All Todd Oxford recordings are available internationally via iTunes, amazon, and other major retailers. Now and again I like to jump right out of my comfort zone and bring you all something completely fresh and contemporary. This time, I jumped into the world of contemporary jazz saxophone. I was excited to receive this commission, and it came to me completely out of the blue. One day, I was sitting at my laptop doing some financial stuff (invoices, taxes etc), and an e-mail popped into my inbox. It was from Todd Oxford, Associate Professor of Saxophone and Chamber Music at Texas State University, who was asking me to put him in touch with my editor at Audiophile Audition (the US-based web magazine I work for). Having done so, we ended up discussing his latest album, and a couple of weeks later, it arrived through my door! 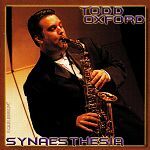 “Synaesthesia” is Todd’s latest offering, and is a disc of contemporary American music for Saxophone (Soprano and Alto) and a variety of forces, including piano, bass trombone, women’s chorus, and wind symphony. From this alone, I knew I’d have quite the varied fare to get through!